Hello friends, today we discuss about how to install xposed framework on android smartphone. Xposed framework can be change behavior of the system and app for modules without touching any APKs. You will easily install xposed framework on Android 5.0, 5.1 Lollipop and 6.0 Marshmallow using this guide. This is a fully working and approved install xposed framework on android smartphones guide. I have personally install xposed framework on android lollipop (Yu yureka plus) and Marshmallow (Letv Le 1s) using this method. When I install xposed framework on android, then I tried so many methods and read lot of guides but I found many mistake in them. So I try to make a prefect guide for it and provide all required tools and drivers in this guide. 4. Your device must be Rooted and install Custom recovery . Step 1: Firstly install hardware info app from Google Play Store on your phone. Step 2: Open hardware info app and check your Android version, processor and check your device instruction sets. 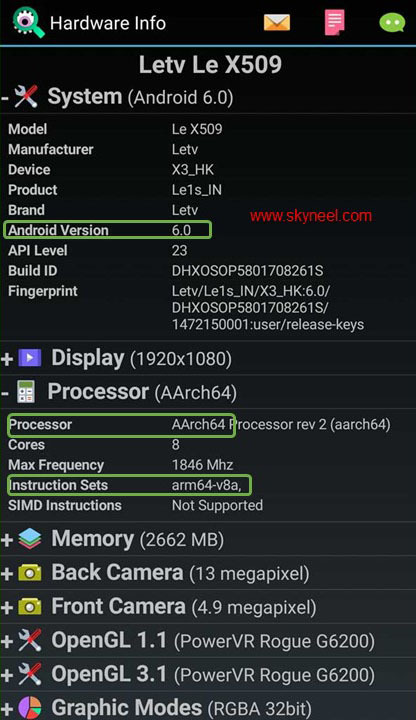 You will see details like given below which will be having ARMv7, ARM64, or x86. Like given in below image. Step 3: Now download required xposed framework.zip from given links and download Xposed installer app, then copy downloaded xposed framework and xposed Installer app in your device storage. Step 5: Now your device in recovery mode then click on install, then select Xposed framework.zip file from your device storage. Step 6: Now swipe to confirm flash and it will take approximately 2-3 minutes. Click on reboot system after flashing procedure complete. Now reboot your android smartphone and it may take some minutes to first boot your device. After install xposed framework on android, you can install many modules your phone because Xposed framework allows you to use a maximum of your phone without any restrictions. After install xposed framework on android you will work for different versions and even ROMs without any changes. I hope you like this install xposed framework on android installation guide from which you will be able to easily install xposed framework on android without any extra efforts. If feel any problem in this guide then please use comment box. Thanks to all.